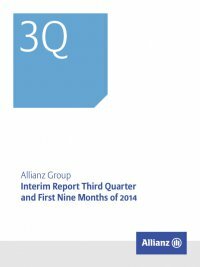 Interim Report Third Quarter and First Nine Months of 2014 Allianz Group90 22 – Interest and similar income interest and similar income € mn three months ended 30 September nine months ended 30 September 2014 2013 2014 2013 Interest from held-to-maturity investments 41 45 124 137 Dividends from available-for-sale investments 325 259 1,216 1,082 Interest from available-for-sale investments 3,436 3,262 10,095 9,878 Share of earnings from investments in associates and joint ventures 22 64 115 111 Rent from real estate held for investment 207 197 629 590 Interest from loans to banks and customers 1,211 1,263 3,646 3,807 Other interest 57 39 150 104 Total 5,299 5,129 15,976 15,709 23 – Income from financial assets and liabilities carried at fair value through income (net) Income from financial assets and liabilities carried at fair value through income (net) € mn three months ended 30 September Property- Casualty Life/Health Asset Management Corporate and Other Consolidation Group 2014 Income (expenses) from financial assets and liabilities held for trading (net) (154) (1,514) – (71) – (1,739) Income (expenses) from financial assets and liabilities designated at fair value through income (net) 1 18 – 3 – 22 Income (expenses) from financial liabilities for puttable equity instruments (net) (1) (16) – – – (17) Foreign currency gains and losses (net) 142 1,288 2 70 – 1,502 Total (11) (224) 2 3 (1) (231) 2013 Income (expenses) from financial assets and liabilities held for trading (net) 11 126 1 52 – 190 Income (expenses) from financial assets and liabilities designated at fair value through income (net) 2 119 27 – – 148 Income (expenses) from financial liabilities for puttable equity instruments (net) – (56) (25) – – (81) Foreign currency gains and losses (net) (53) (720) (2) (44) – (820) Total (41) (531) 1 8 – (563) Income (expenses) from financial assets and liabilities held for trading (net) Business segment Life/Health For the three months ended 30 September 2014, income and expenses from financial assets and liabilities held for trading (net) in the busi- ness segment Life/Health includes expenses of € 1,519 mn (2013: income of € 117 mn) from derivative financial instruments. Included in this are expenses of € 1,160 mn (2013: income of € 320 mn) from financial derivative positions of German entities, of which income of € 176 mn (2013: expenses of € 11 mn) relates to duration management, income of € 13 mn (2013: expenses of € 8 mn) relates to protection against equity fluctuations, and expenses of € 1,323 mn (2013: income of € 343 mn) relate to protection against foreign exchange rate fluc- tuations. Also included are expenses related to fixed-indexed annuity products and guaranteed benefits under unit-linked contracts of € 260 mn (2013: € 222 mn) from U.S. entities.